1. Connect 3D pen to power bank, USB port or plug it in. 2. Press Heat Up button so nozzle will heat up to 176°F. 3. Load PCL refills. Double hits Feed button for drawing. 5. Tip: Single hit Feed to pause and double hits/long pressing to draw again. 6. Unplug 3D pen after use. 1. First single hit Feed to pause the pen, then single hit Unload to reject refills completely. 2. After unloading, long pressing Unload button so 3D pen will be Standby mode. 3. In standby mode, you can continue drawing by double hits Feed. 1. Unload PCL refills after use, and disconnect or unplug it to turn it off. 2. Use PCL filaments ONLY. DO NOT pull PCL refills. 4. If filament was left in 3D pen, press Heat Up button to heat up and continue drawing for seconds. Then unload refills if you want. Practice toys to keep kids busy. Drawing with 3D doodler pen is amazingly interesting, and also a little bit challenging. Tell your kids they can do it. Best gifts idea for teens and girls. 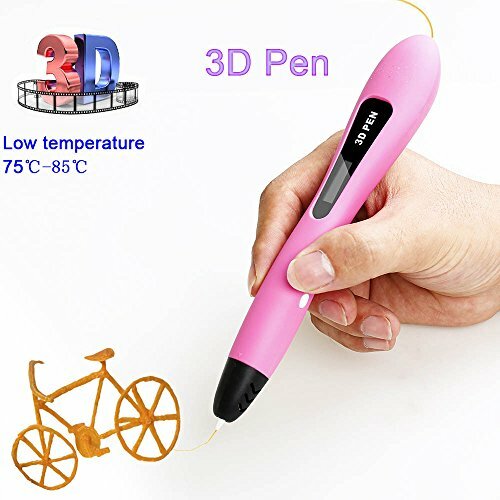 3D drawing pen is a perfect gift option for 5 6 7 8+ yrs old girls. With little patience, they can build up interesting 3D works. Most kids-safe 3D pen. Pen nozzle is working at low temperature (185°F ). You can't stop the curiosity of kids. ABS PLA 3D pen is just not too hot for kids (320°F). Healthy PCL Refills. This 3D doodler pen uses PCL filaments, which is made from corns. NO ODOR. It has better stickness than ABS or PLA refills. Good option for beginner and advanced levels. This is very easy to use for all users. You can even create 3D works like animals, puppets, dinosaur, fingerling and more. If you have any questions about this product by Sundi, contact us by completing and submitting the form below. If you are looking for a specif part number, please include it with your message.